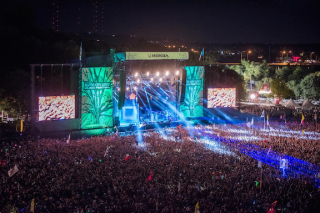 The Austin City Limits Music Festival returned to Zilker Park for two three-day weekends in October to showcase more than 130 rock, pop and hip hop artists on eight stages, including Outkast, Beck, Eminem, Skrillex, Calvin Harris and Pearl Jam. Clay Paky A.leda B-EYE K20 and Sharpy fixtures were on hand to provide lighting support and control for festival performers. He also gives kudos to the K20s. “We just turned them on and they worked long days – maybe 19 hours a day. All the lighting designers really got into them and were very happy with the rig. George Masek, A.C.T Lighting Vice President - Automated Lighting, commented ""It is a pleasure for to have the chance to work with Seth again. His designs are always innovative and he's always thinking of ways to get more out of the luminaires. We're also very proud to work with LD Systems this year providing the fixtures. They have been great partners for us."